In 2016, Jim Frey and Mary White Frey stepped forward and grabbed hold of the torch held by the Benedictine Sisters for 100 years. 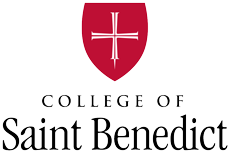 They committed a $1.5 million gift to the College of Saint Benedict aimed at creating scholarships at CSB for students from under-represented communities. Mary is a 1980 graduate of the College of Saint Benedict and her husband, Jim, is a 1978 graduate of Saint John’s University. This is why they grabbed hold.